Each short course contains six-sessions, supported by online audio-visual resources. All sessions combine a simple framework prayer, reflection on the Bible in the lectio divina style, an article by a modern writer, and time for questions and reflection. The second book in the Follow Stage explores one of the greatest Christian treasures, the Lord's Prayer. This pack contains twenty five copies of the book. Pilgrim: The Lord's Prayer Follow Stage Pack of 25 by Paula Gooder; Robert Atwell; Stephen Cottrell; Steven Croft was published by Church House in March 2017 and is our 19136th best seller. The ISBN for Pilgrim: The Lord's Prayer Follow Stage Pack of 25 is EDENBUNDLE-1854. 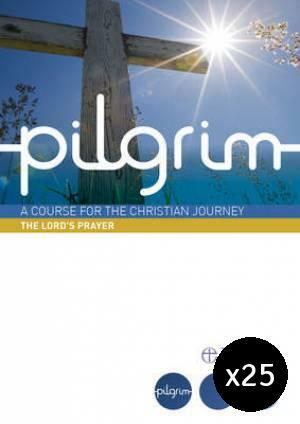 Be the first to review Pilgrim: The Lord's Prayer Follow Stage Pack of 25! Got a question? No problem! Just click here to ask us about Pilgrim: The Lord's Prayer Follow Stage Pack of 25.